Tarot of Jane Austen depicts characters and situations from the books of the 19th century English author Jane Austen including Pride and Prejudice, Emma, Sense and Sensibility, and Mansfield Park. The deck does an excellent job of matching characters from these works with tarot archetypes. The suits are Candlesticks (Wands), Teacups (Cups), Quills (Swords) and Coins (Pentacles). 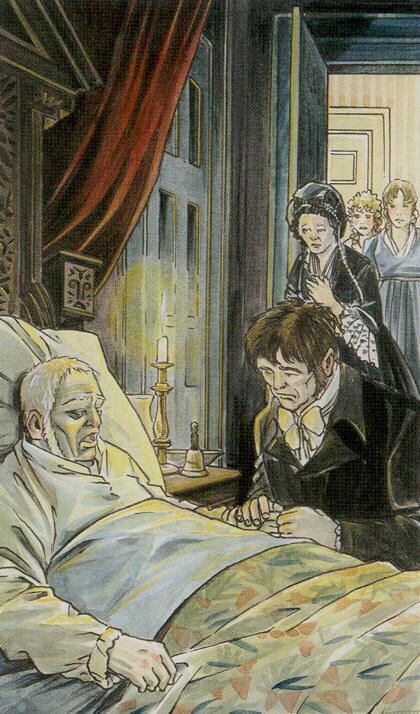 The Death cards is a scene from Sense and Sensibility, which shows an older man lying in bed in his well appointed bedroom, his worried wife and daughters standing at the doorway, while his son kneels at the bedside.